Tragedy struck on Friday when a tenant, identified as Orobosa, allegedly stabbed his neighbour to death on Ekiosa Street, in the Ikpoba-Okha area of Edo State. 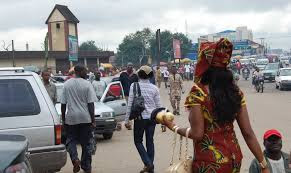 The suspect was said to have had an argument with the deceased, one Okereke Chinonso, over the use of a bathroom in the building located around the Second-East Circular Road in Benin. The Police Public Relations Officer, Mr. Chidi Nwabuzor, confirmed the incident, adding that the suspect had been arrested. Nwabuzor also stated that the command had launched an investigation into the matter. It was learnt that trouble started when the wife of the deceased, Martha, wanted to take her bath in one of the bathrooms but was told by the suspect to use the one with a faulty door. The victim was said to have confronted Orobosa, asking him why he prevented his wife from using the bathroom. It was gathered that an argument ensued between the two after which the suspect allegedly hit the victim in the head with a wooden object and later stabbed him. Okereke was said to have been taken to a hospital in a wheelbarrow but was confirmed dead on arrival. It further learnt that some youths in the area mobilised to the building and attempted to set it ablaze before they were prevented by some policemen. Other tenants in the building were also said to have fled to avoid being caught up in the pandemonium. A resident in the neighbourhood, who spoke on condition of anonymity, said that the suspect was a Libya returnee. “But the woman (Martha) decided to use the other bathroom because his (deceased) landlord had yet to fix theirs and, as I speak, they do not even have a toilet,” the source added. The widow said that the suspect, who was also the caretaker, chased her husband into their apartment and stabbed him repeatedly with a knife. Martha explained, “He (suspect) said my husband and I should not use the bathroom again. My husband came back and saw that I had not taken my bath and went to ask the caretaker. “But the caretaker started shouting that he had been warning my husband. As he was shouting, he used a mortar to hit my husband’s head.